© Disclaimer and Copyright Notice: “All pages, their contents and related items are provided as is. Thus no liability, consequential or otherwise, rising from them is accepted. Where not already belonging or assigned to others, all material remains our copyright. 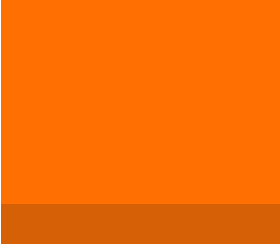 CAMRA East London & City 2019” Parts of this website were updated 11 April 2019. See the pubs lost since 1991. Here in the capital we have a major threat to our pubs. This threat takes on many forms, from supermarkets and convenience stores, through betting shops and payday loan firms, to greedy developers wanting to make a quick profit on hastily thrown up blocks of overpriced flats. In the East London & City area, we have lost around HALF our pubs in the last 30 years. In some postal areas, the attrition rate is even higher. It is time to stop the rot! At the 2013 CAMRA national conference, Motion 12 was carried calling upon all branches to appoint a pubs preservation officer with lead responsibility for mounting or supporting campaigns to save threatened pubs and to secure the adoption of planning policies supportive of community pubs. Here in East London & City, the pubs preservation officer is James Watson. Contact him at savethepub@pigsear.org.uk James will be fighting hard on behalf of the branch on two principal campaign aims over the coming months:Working with local authorities, the London Assembly, other CAMRA branches and CAMRA HQ to influence and improve planning law and planning policies so that pubs receive proper legal protection as the vital community institutions that they are; Working locally in the branch area to actively preserve what pubs we have left by supporting local campaign groups fighting to keep pubs open and by encouraging and nurturing the re-establishment and re-opening of any closed or disused pubs in our area. 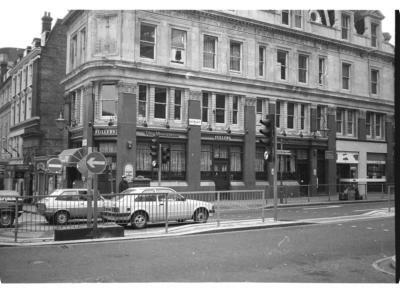 There are a variety of different reasons why half our pubs have vanished over the last 30 years. Perhaps we had too many? Was there oversupply? People have different leisure activities today to what they had 30 years ago The smoking ban The economic downturn Cheap supermarket booze Changing demographics of the population The beer-tie Tax, business rates, licensing issues Changes in social attitudes towards drinking at lunchtime or drinking and driving All these issues (and many more) have played a part. However in London the issue of pub closures is particularly severe despite there being a huge population and lots of tourist trade providing a solid customer base. The culprit is land prices! From around 2001 onwards, the trend of pubs being bought cheap and turned into lucrative flats or houses by rapacious developers has steadily increased and continues today. We all know that successful well- managed pubs are sound businesses and make a profit. They cannot compete with the immediate capital resale value of land with development potential. The ground that these lovely historic buildings sit on is worth more than the ongoing business of the pub in the eyes of faceless corporate greed. What about the needs of the local community, the wishes of the neighbours or the loss of the social amenity by London’s pub users? Local authorities ought to be fighting for these groups. Sadly in many cases they do not. That is where your local CAMRA branch should, can and now will assist. Our long-serving regional director and former CAMRA national exec member, John Cryne, has recently stepped down from the regional director role to focus exclusively on being the CAMRA North London pubs preservation officer – that is how important he considers the role to be! Many CAMRA branches do not have a pubs preservation officer but are being encouraged by HQ to appoint one urgently. The preservation of the remaining pubs that we have in this country is a top priority for CAMRA and forms one of our leading campaigns. It is also a top local priority for us here in East London & City CAMRA and one we are taking very seriously. "On 26th January 2015, following intense campaigning by the Parliamentary Save the Pub group, backed by CAMRA and Licensees Supporting Licensees (LSL), Communities Minister Stephen Williams MP announced in the House of Commons that the government would remove permitted development and demolition rights from all ACV-registered pubs. Although this falls short of the blanket protection that CAMRA has called for under www.pubsmatter.org.uk, it is a very welcome step in the right direction. The legislation came into force on 6th April 2015 via an amendment order, and on 15th April 2015, the Town & Country Planning (General Permitted Development) (England) Order 2015 became law. This legislation places the onus on the developer. If a developer wants to change the use of a pub, ANY pub, they must first write to the Council to find out if a nomination for ACV status has been made. If so, the permitted development rights are immediately suspended and the change of use is not allowed for 56 days. If the Council then decides to list the pub, the permitted development rights are permanently removed, meaning that any change of use or demolition will require planning permission. After three years of ACVs being available, and until now being largely tokenistic, we now have some meaningful planning protection for pubs. Making an ACV nomination is quick and easy, and following a landmark ruling on January 2015 by the First Tier Tribunal over the case of The Windmill in Sydenham, CAMRA branches are eligible to nominate pubs for ACV status. Our branch will be discussing our strategy for this in the near future. In the meantime, if you need help listing your own local, drop James a line. How can WE help YOU save London’s Pubs? Firstly, we cannot wave a magic wand and save every pub from closure. If only. Even CAMRA recognise that there are some circumstances, usually rare, where closure or demolition of a public house is the best solution. However we will always begin from a standpoint of trying to save any pub building, whether there be an active trading pub business present or not. If you are concerned about the future of your local, or a pub that you like to use, there are steps we can take to support you and assist in saving it. As a volunteer organisation we cannot run every single pub campaign in our area as we simply do not have the resources or time. We can give remote support and assistance to an established campaign or try to start a new campaign that local people and users of the pub can then continue. Examples of the help we will offer are: Planning law issues – how to object to planning applications with the local authority Working with the local authority to guide them in their approach to pub protection through planning tools e.g. Conservation Areas, Article 4 Directions, Registration as an Asset of Community Value Help local campaign and community interest groups prepare submissions for registration as an Asset of Community Value (ACV) under the Localism Act 2011 Use our contacts to help spread the word and provide additional publicity via London Drinker, CAMRA websites, local press, local blogs, social media etc. Advise on contacting decision makers and opinion formers – Ward Councillors, Mayor, Assembly Member, MP, Mayor of London (we have even written to Her Majesty the Queen about pub protection!) We have extensive contacts in the private sector including breweries and pub operators who are constantly seeking new outlets. We may be able to save your pub by finding a suitable buyer who is willing to take it on. Helping you mobilise local support from the immediate and wider community using poster campaigns, rallies, pop-up-pubs, petitions, door-stepping and leaflet drops Pointing out flaws in any proposal to convert to residential, demolish or change of use (in some cases unfortunately planning permission may not be required but we can still lobby local authorities to take action if there is strong community support for the pub) Object with your campaign to any loss of the pub in our capacity as an established consumer rights organisation Pub under threat? Need advice? Want to start a campaign but do not know where to begin? Email savethepub@pigsear.org.uklab How can YOU help US save London’s Pubs? Intelligence is key! Many pubs close overnight because nobody takes an interest to highlight their plight. We hear about pubs being sold under the radar without the local community being aware and then we often get told the day before (sometimes just minutes before!) demolition begins. By this stage it is too late to save the pub. If you have information on a pub under threat, PLEASE let us know immediately. Time is of the essence. There is no substitute for drinking in and using your pubs. Regular pub-goers represent our eyes and ears on the front line. The honest and loyal users of London’s boozers are effectively our spies. Nobody knows better than you what is going on at your local, apart from perhaps the landlord. Talk to the landlord, talk to the bar staff, talk to the other regulars. Find out what the status is of your treasured local. Who owns it? Is it freehold or leased? Who is the pub co? Who does the landlord pay rent to? How long is the lease? Are there any planning applications in your local council paper? Any notices or “For Sale” signs outside the pub? Spot anything dodgy, report it to us. The sooner we hear the more chance we have of helping to save it. 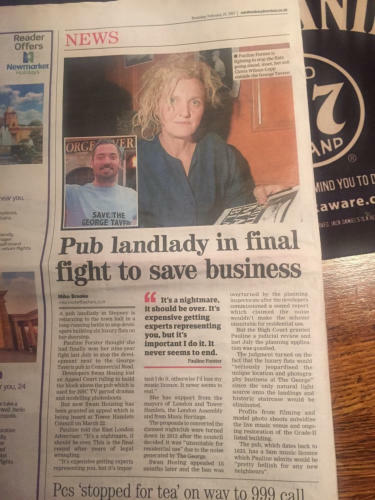 Spread the word, keep your eyes and ears open and email anything of interest to savethepub@pigsear.org.uk There will be updates on our local pub preservation activities here. We try to keep our eyes and ears out for pubs under threat but we rely on the locals and regulars to give us early news. That way we might stand a chance at helping to save the pub. As always, please drop a line to us as soon as you hear any rumours about pubs in our branch area. Thanks. The following motion was tabled on 2nd July 2014: That this House believes that permitted development rights are leaving pubs in England vulnerable to demolition or conversion to a range of retail uses without planning permission; further believes, in light of evidence from the Campaign for Real Ale, that two pubs a week are converted to supermarkets, and that these planning loopholes are contributing to the loss of valued community amenities; is concerned that local people are being denied a say in the future of their neighbourhoods; and so urges the Government to bring forward amendments to the General Permitted Development Order 1995 so that any demolition or change of use involving the loss of a pub would require planning permission. This is an important motion in a campaign to make planning authorities take responsibility for development plans to change the use of pubs, particularly within the wider chapter of "retail premises". Ultimately this will require amendments to legislation to enable DCLG, or whatever replaces it, to require planning permission to be granted in such circumstances and ultimately to require a public interest test to be satisfied. We need ALL our MPs, excluding those who are in the Government and so are ineligible, to sign the motion. It seems that a number of local MPs have not signed. It would be helpful if there was a clear way of linking signing MPs to CAMRA braches, however there is a clear task for us all to lobby our local MP by e-mail and to request that they should sign the motion. Please confine these e-mails to your local MP and include your postcode within your signature. The link to the motion can be found here: http://www.parliament.uk/edm/2014-15/208 From here, you can filter on the headings to see who has signed, their party etc. To date 66 MPs have signed this motion. The spread across parties is good, but signatures from London MPs in general are low. Diane Abbott, Kate Hoey, Frank Dobson, Bob Blackman and Zac Goldsmith being some notable exceptions. Campaigning for real ale, pubs & drinkers' rights since 1971.